Spring is here, although you can't tell by today's weather (32 and snow). Yesterday it was 71 and Sunny. That's life in Chicago at this transitional time of year. 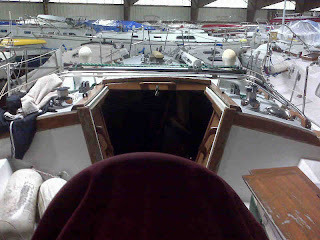 This is the view from the helm inside Crowley's inside unheated (or cold storage as I call it) storage shed. There was more activity at the yard than I expected due to the weather. I saw people working on 4 or 5 other boats. Today Mike and I began topping off battery charge and assessing spring projects. Other than normal spring washing and waxing, rubrail replacement and outhaul upgrade are on the list. We removed the boom end caps to remove the outhaul. Awesome shot of boat and Chicago bridge w/ship. The oil slick in Gulf is sickening! Check out Sailing Anarchy's commentary.